Cannes is best known for its May film festival, but the Yachting Festival de Cannes (September 11-16) marked the official start of the boat-show season in Europe. Fifteen years ago, Cannes was just a regional event, but it has since become the must-attend for every major yacht builder in the world. The largest yacht at Cannes, the 157-foot Baglietto 48m T-Line, seems small compared to the largest yachts at the Monaco Yacht Show (September 26 to 29). But the Cannes show’s 120 world premieres dwarves every other boat show on the globe. This year’s event had nearly 600 boats in the water and on the docks at the Vieux Port and Port Canto (where brokerage yachts are displayed), along with water-toy and tender sections. One of the primary attractions of the show is its location on the French Riviera. The beautiful, blue Mediterranean makes an exceptional backdrop (and a great place to sea-trial the yachts), while the French cafés, chic shops, and seafood restaurants are just steps from the show. Here are some of the hottest new debuts this year. #1 Princess Yachts R35 A collaboration between Ben Ainslie Racing Technologies and Pininfarina gave birth to the UK-based Princess Yachts R35 sport yacht, debuting in Cannes this year. America’s Cup technology channeled into the Princess Active Foil System means less drag for the R35, providing stellar stability, comfort, and manoeuvrability in all sea conditions. Italian car-design firm Pininfarina — known for its work on such marques as Ferrari, Maserati and Alfa Romeo — designed the lightweight carbon-fibre monocoque hull. Side air blades maximise engine airflow and mange stern turbulence, improving comfort all the while. 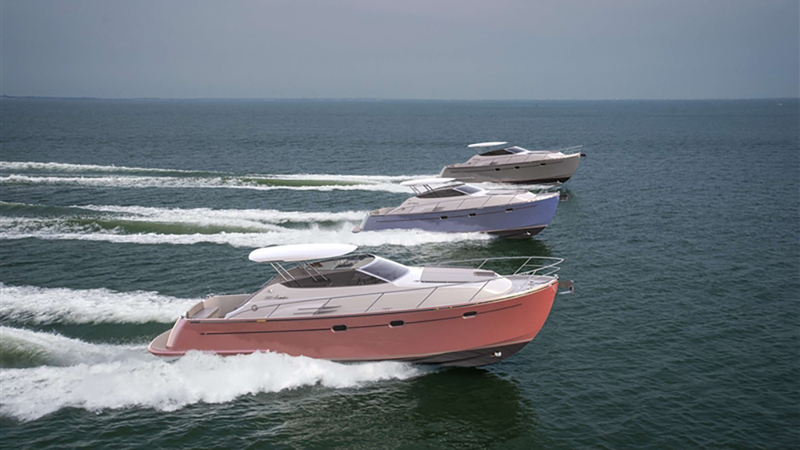 Two aluminium V8 engines give the boat a 50-knot top-end speed — the fastest Princess ever. Posh interiors by Princess remind us that it’s a yacht. 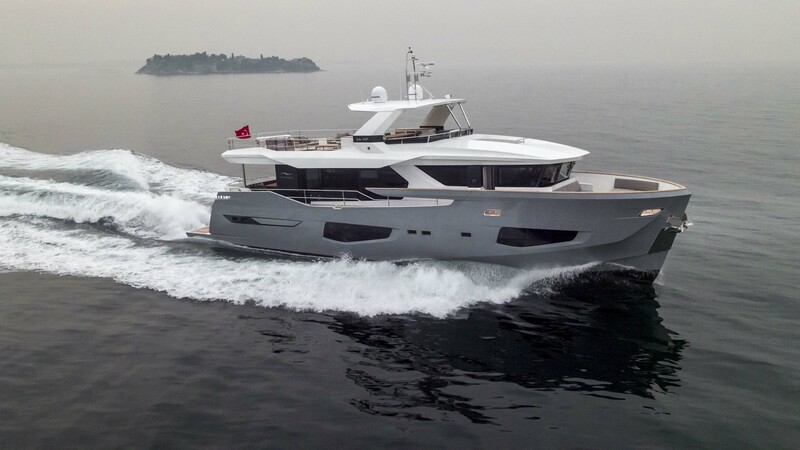 #2 Cantieri Estensi 380 America The 38-foot 380 America from Italian yard Cantieri Estensi is the first of the new line of America yachts — and it comes in several fun colours and multiple options. With design and engineering by Zuccheri Yacht Design, this timeless-looking, lobster-style, centre-console yacht has the option of two cabins down below, or just one large open-plan space. Plus, choose from a cockpit kitchen or a below-decks one. And then pick which engine: two 280hp or a pair 370hp Volvo Pentas. You can also decide to use it as a weekend cruiser, or pair it up with your superyacht to be used as a tender. So many decisions. #3 Bladerunner 45 GT Combining a performance hull with a luxury topside can be tricky, since most yacht builders can either do one or the other, but rarely both. Bladerunner’s new 45 GT, premiering at Cannes from Ice Marine in the UK, accomplishes both missions. The 45-footer reaches a top end of 50 knots, thanks to its stepped hull, designed to funnel air so it lifts the boat higher over the water, and triple 370hp D6 Volvo Penta engines. The GT designation, standing for Grand Tourer, kicks in above the waterline, with a big sunbed on the open stern, enclosed social area in the cockpit and a very generous cabin below. The Bladerunner has GT-like features rarely seen on any yacht, including electric side windows, suspension seats for rough-water running and a superyacht’s electronics package. Belowdecks, plenty of natural light fills the contemporary cabin, thanks to overhead glass panels and side windows. If 50 knots is just not enough, Ice Marine can up the speed to 70 knots (128 km/h) for “specialist” applications. #4 Mazu 52 Known for quirky, unconventional but well-built day boats from 38 to 82 feet, Mazu’s new 52-footer will raise the bar in the luxury weekender category. 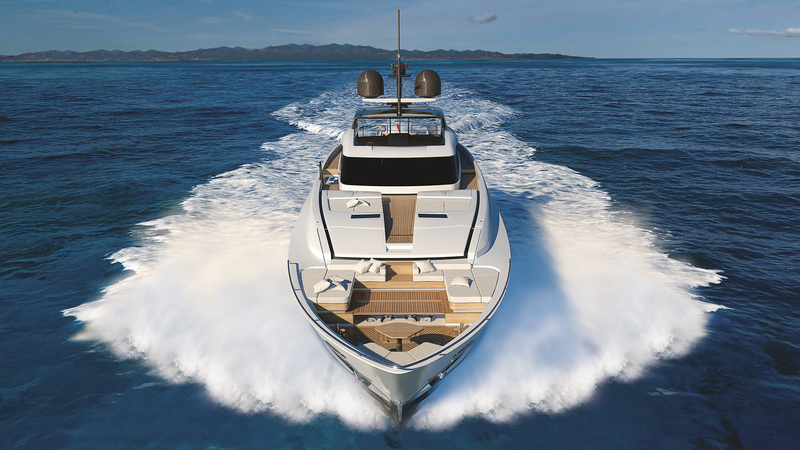 Launched at Cannes, the 52 shares the high bow and protected cockpit of its siblings, along with big sunbeds, tables and lounges in the cockpit and an open transom. But the two-cabin interior is a departure for Mazu. The new design offers not only superior protection in big seas (thanks to the closed-in bow), but also a much more comfortable overnight experience. Mazu dressed the interior in soft Foglizzo leathers, with classy Bianca marble veneers laid over a lightweight aluminium substrate. The hull layup includes a high percentage of carbon-fibre in the sandwich construction, with a full carbon-hard hardtop. Mazu is more conscious than most builders in keeping its boats as light as possible, without compromising strength. 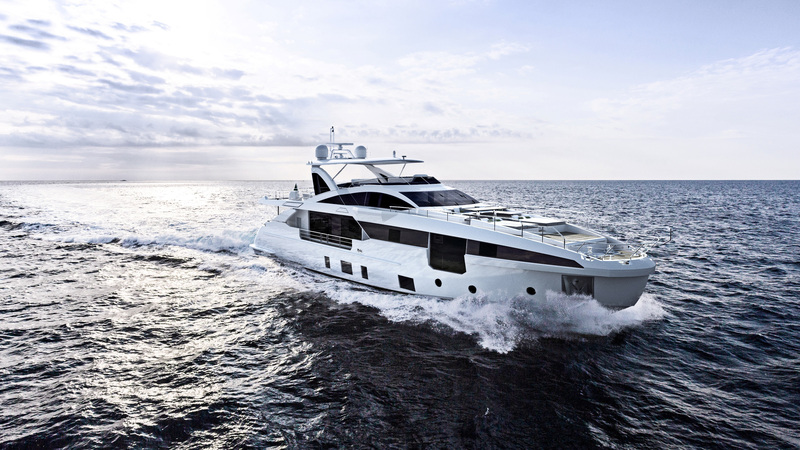 The 52 will be powered by twin Volvo IPS 800 engines that deliver a top speed of 36 knots, with a cruise of 32 knots. #5 Bluegame 62 Just the name Bluegame sums up the fun mission of this new launch. The much larger sibling of the Bluegame 42 has a walk-around design that squeezes every centimetre of usable space out of the topsides. That includes that sun cushion on the hardtop, an area that is never used for people. The designers included plenty of other room to roam around the cockpit, including a large sunbed on the foredeck and an even larger sunbed in the center cockpit, with yet more sunbeds and lounges facing the stern of the yacht. The wide-open transom puts you about 30 centimetres above open water. The aft platform of the stern is designed for carrying a tender and lowers into the water for easy launch and retrieval. 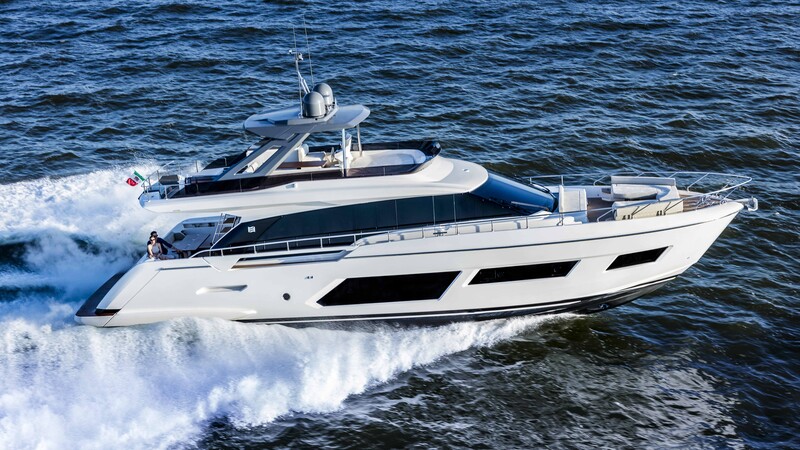 Though this 62 screams day-boat, the interior includes a full-beam master suite, forward cabin, and saloon with a large couch that seats eight, opposite the galley. One of the more exciting categories as this year’s Cannes show will be luxury day-boats, and while this yacht suits that category, anyone interested in this handsome boat will soon find out that they won’t be shortchanged belowdecks, either. 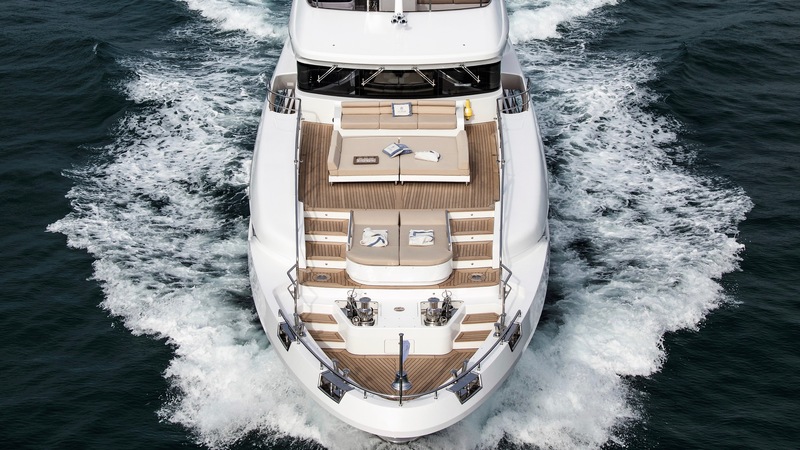 #6 Ferretti Yachts 670 The Ferretti Yachts 670 flybridge yacht sports exterior design by Filippo Salvetti — his first for the brand — and the Ferretti Group, and an interior also designed by the Ferretti Group. The 67-foot yacht sports a 25-square-metre flybridge with loungers, bar, dining table and settee, and a foredeck fitted with lounging space. An open-plan main deck provides a spacious feel, as do the numerous windows. Belowdecks guests will find an amidships full-beam master suite, a full-beam VIP stateroom forward, and a twin cabin. An optional version comes with a single captain’s cabin. 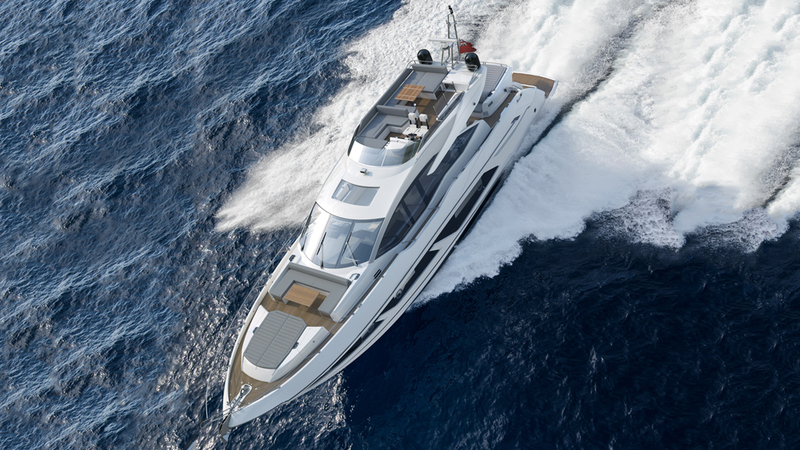 Ferretti offers two engine choices: either a pair of 1,000hp or 1,200hp MAN diesel engines, which propel the 670 to either 28 or 32 knots. The yacht’s cruise speed is 25. #7 Sunseeker Sport Yacht 74 The new 74 Sport Yacht from British boatbuilder Sunseeker has its world premiere in Cannes. Borrowing design and performance features from the Sunseeker Predator 74, the 74 Sport Yacht offers up a huge flybridge, with helm station, seating, dining and sunbathing spaces. A bimini shade and wet bar are optional. A large sun pad and U-shaped dining area forward of the helm on the foredeck provide an excellent location for a sunset cocktail or a meal with an amazing view. The 74 Sport Yacht transforms into an open yacht when the weather is nice or a closed yacht when it’s not, thanks to a cockpit door that lowers itself into the sole of the yacht — kind-of like a convertible. This 74-foot yacht sports a 38-knot max speed, a cruising speed of 28, and a range of 330 nautical miles. The tender garage stows an optional Williams 395 SportJet. #8 CCN Freedom CCN’s Freedom, owned by fashion designer Roberto Cavalli, makes its world premiere in Cannes. The fully custom 88-foot yacht, which is part of CCN’s Fuoriserie line, was designed by Cavalli along with his friend and designer Tommaso Spadolini. The yacht’s strong exterior lines and bold interior reflect Cavalli’s personality. He aimed for maximum privacy while still allowing for close proximity to the water. This can be seen in several locations. Situated aft of the helm station, Cavalli’s master suite takes over the whole main deck, while a skylight bathes the space in natural light. In addition, the aft cockpit sports privacy curtains so he can relax on deck without being seen. Up top on the flydeck is another private area with a helm station. Two guest staterooms and crew quarters are housed down below. A tender is stored on the foredeck. With both an aluminium hull and superstructure, as well as three waterjet engines, Freedom boasts a top speed of 40 knots. 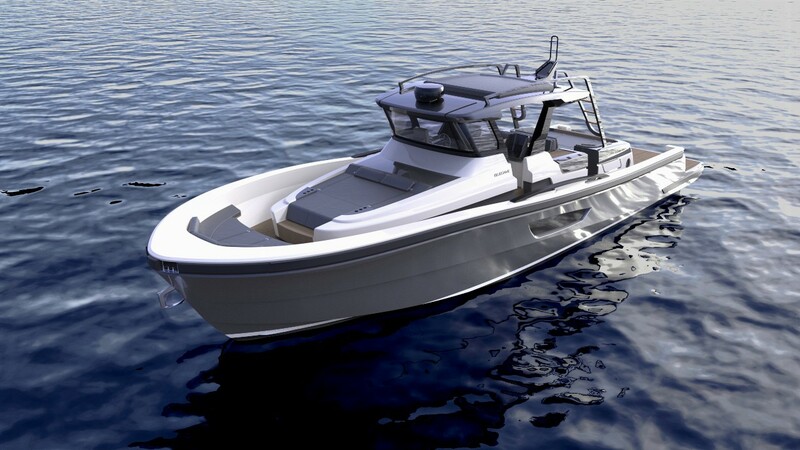 #9 Numarine 26XP Making its global debut at Cannes, Numarine’s 26XP represents the new breed of mini-expedition yachts. Along with its sister the 32XP (making its European debut at Cannes), the 85-foot 26XP has a highly efficient hull, high freeboard and intrepid profile, and a special flybridge that covers about two-thirds of the hull’s length. The bridge has 100 square metres of usable deck space, allowing owners and guests to find their own private areas with space left over on the aft deck for a tender. The yacht has a generous, full-beam saloon on the main deck, with full-height windows, a dining area, and settees for congregating. Designer Cal Yalman also left abundant space belowdecks for the four staterooms, including the full-beam master suite amidships, where the yacht is widest. A VIP and two twins comprise the other three. Numarine worked with Silent Line to make the yacht as noise- and vibration-free as possible, using techniques that are more often applied to superyachts. The yacht comes in a displacement-hull version, which has a maximum speed of 13.5 knots. At eight knots, its range is 3000 nautical miles. The semiplaning version has larger engines and pushes the 85-footer to an impressive 28 knots. 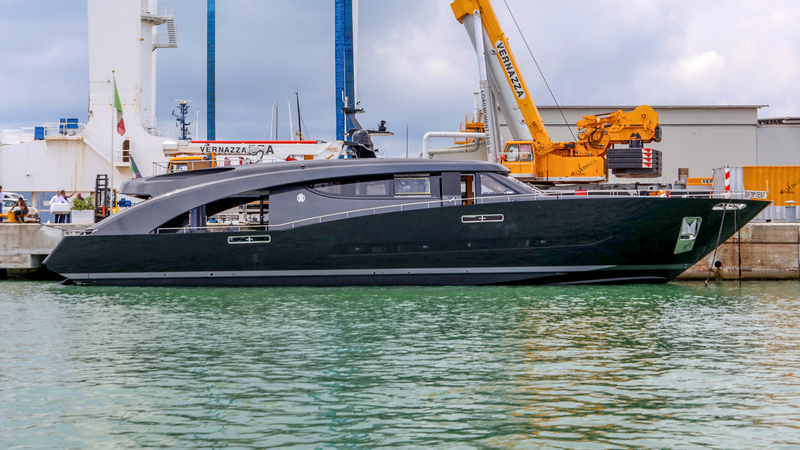 #10 Dominator Ilumen Cadet V Austrian-owned, Italy-based shipyard Dominator presents its fifth Ilumen 28m superyacht, the series that made news last year with its first hull, Kalliente. The 92-foot semi-custom Cadet V sports an efficient semi-displacement hull and a shaft propulsion system, with further technological and interior tweaks taken from suggestions by those familiar with the first few hulls. 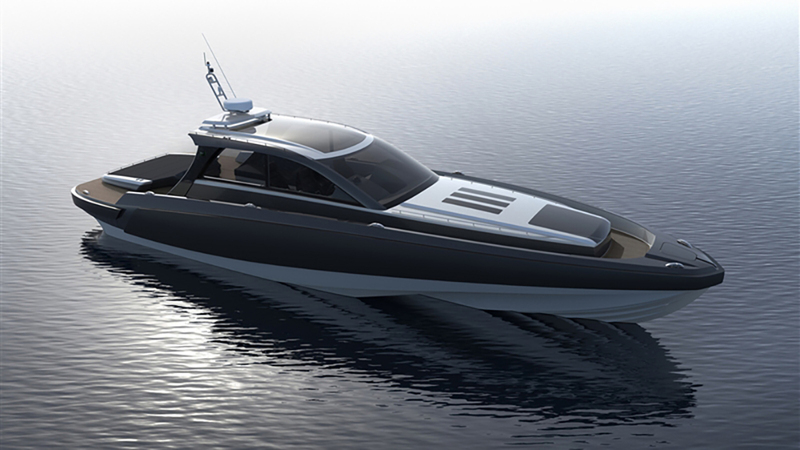 Yacht designer Alberto Mancini created the exterior, and Dominator chief designer Luca Catino crafted the interior. Cadet V’s owner is a fan of artist Stefano Curto, whose work incorporates thousands of colourful Swarovski crystals. Several of his pieces are featured on the yacht. Floor-to-ceiling windows on the main deck are great for the mesmerizing Curto work hanging in the main saloon — and not bad for views and natural light either. The yacht sleeps eight guests in four staterooms, including an owner’s suite that this owner extended for space. In addition to the owner’s suite, Cadet V offers up three staterooms — a full-beam master and two VIPs — on the lower deck. Crew quarters accommodate three crew members. The yacht carries a Williams Jet Tenders SportJet 395 and a Radinn Wakejet, plus toys, in its tender garage, and its beach club provides easy access to the water. Cadet V boasts a maximum speed of 21 knots and a cruise speed of 14. #11 Benetti Delfino 95 Benetti has been building boats since 1873, but there is nothing traditional about the new Delfino 95, named Christella III. The superstructure, all curves and wave patterns, is arguably the most contemporary semicustom design the Italian builder has launched for many years. But the yacht’s function extends far beyond its form. Benetti has turned the traditional foredeck into an outdoor sun platform, with a large sunbed forward and a set of lounges on the next level up. The section is actually on the same level as the rear flybridge deck, so owners and guests can simply walk around the sides, instead of going through the interior and climbing stairs to reach the different areas. The 95 also has a private nook above the hardtop, where the captain can drive or guests can huddle in a small group for the best view on the water. The interior design by Achille Salvagni, the Rome architect who made his name in contemporary homes, is curved, fluid and as unorthodox (but beautiful) as the exterior. A forward, full-beam master suite on the main deck provides plenty of space for Christella III’s owners, while the dining area and saloon in the rear are comfortable but elegant gathering areas. On the deck below are four staterooms for eight guests. The Delfino 95 can also accommodate five crew in three cabins. This newest Benetti is a nice departure for the storied brand: not too far out there, but wild enough to set it apart from the rest of the 100-foot pack. #12 Azimut Grande 32 Metri The Azimut Grande 32 Metri, which premiered at Cannes, has a muscular-looking exterior from Stefano Righini, but the Achille Salvagni interior is all curves and light. Salvagni, known for whimsical but elegant rooms, designed the 105-foot Azimut yacht with custom table lamps and overhead fixtures as well as bespoke furniture. The master suite has full-height windows that bathe the sleeping area in natural light. Righini designed excellent usable space across the exterior, with a large beach club at the stern and a flybridge divided into a dining area, central social area, and relaxation area in the bow (with a mini-Jacuzzi). Twin 2200hp MTU engines give the boat a top speed of 26.5 knots. #13 Arcadia 105 From its start in 2005, Arcadia set out to be a different kind of yacht builder. Some of its defining characteristics: eco-conscious without compromising comfort and luxury, large interiors with lots of thermally insulated glass, hybrid propulsion, convertible exterior spaces and solar panels integrated into the hull. The Italian builder was so far ahead of its time that it now has many imitators. 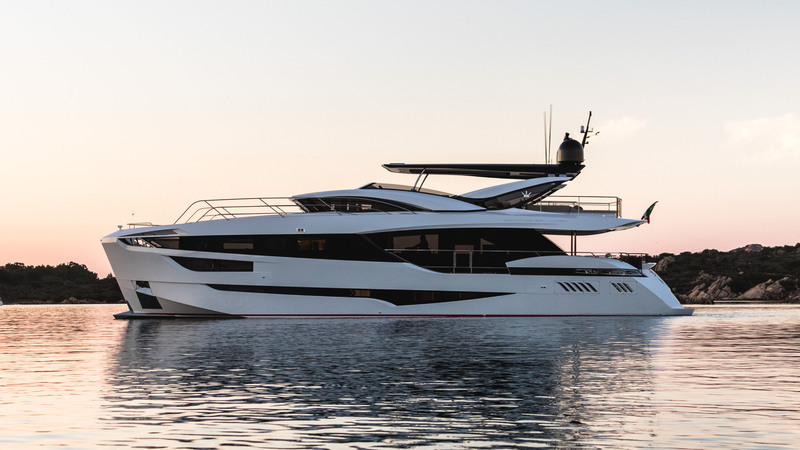 Its new 105, which will make its world debut at Cannes, ticks all the builder’s boxes in a supersized way. Its upper deck has a skylounge that opens into the aft sun lounge, creating 56 square metres of relaxation area. A dining table seats up to 10 on the rear of this deck, but seating space can double by using the forward area. The owner of the first 105, his third Arcadia in seven years, also mandated custom features like a master suite with its own set of stairs for privacy, a winter garden at the front of the boat that doubles as a children’s play area, and three other staterooms that include two VIPs and a double. 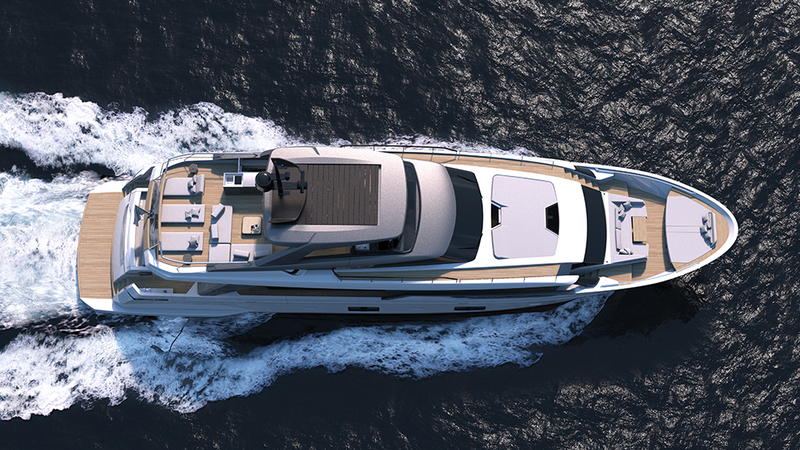 The builder offers 50 choices of interior layout, so the new eco-superyacht can be configured to just about any taste. Arguably the hottest studio in superyacht design, UK-based Reymond Langton was behind the contemporary but elegant look of the new Viatoris, the 133-footer from Conrad shipyard. The designers did away with the usual stacked wedding-cake look, and instead introduced curves to the rear of the upper decks that lend an air of individuality to its blue-and-white profile, while also providing an exceptional view for the owners and guests. 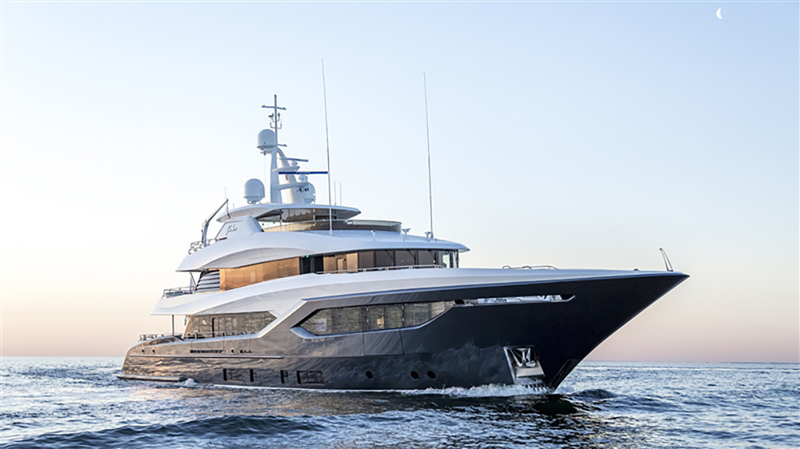 Besides the unusually ornate interior, the 133 differs from other yachts in its class with the four balconies that open outward on the main deck (two on in the master suite and two in the aft saloon) that give an open-air feel to these areas. The owner uses Viatoris as a home on the water, rather than a weekend retreat, which explains the full-beam master suite, generous social spaces on the bridge and sundecks, and custom interior. #15 Chaser 500R Nobody can beat the Italians at fast, luxury rigid-hulled inflatables, except maybe a Dutch company called Chaser Yachts. Powered by triple 400hp Mercury outboards, its new 500R promises to be a very fast boat, with a top speed that passes 55 knots. 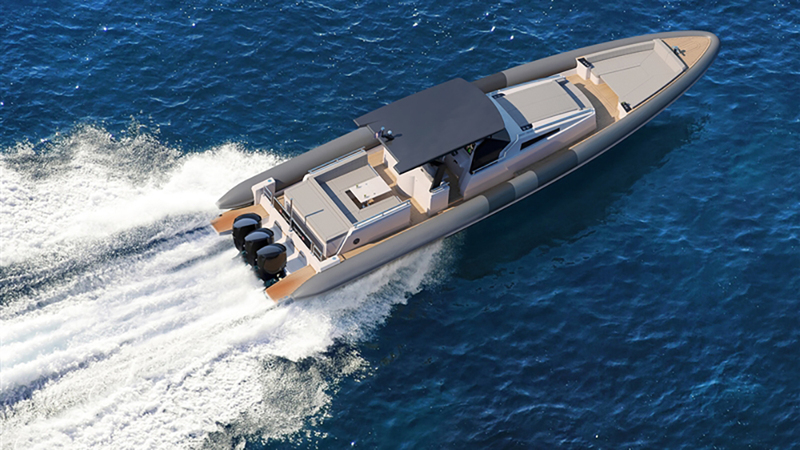 Chaser designed the 50-footer as a tender for a superyacht, but it would make an outstanding weekend boat with its two cabins, protected cockpit, and open transom. 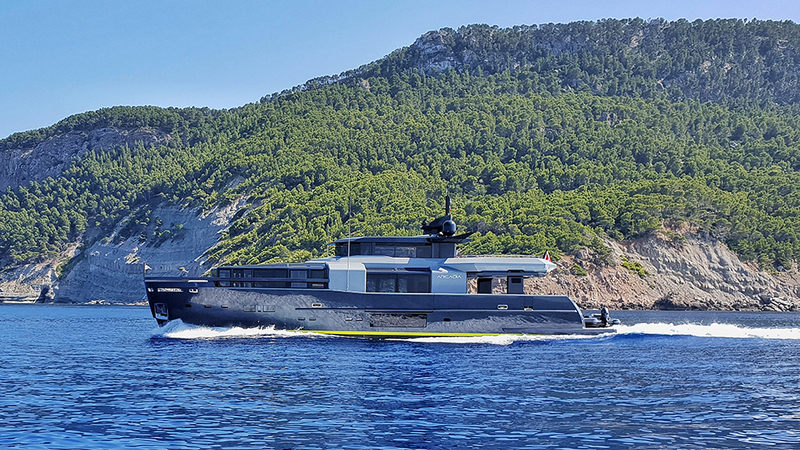 Yacht designer Guido de Groot did a masterful job with the exterior design, making it look sleek and safe, while the aluminium construction of the hull and rubber inflatable tubes promises seaworthiness and longevity. 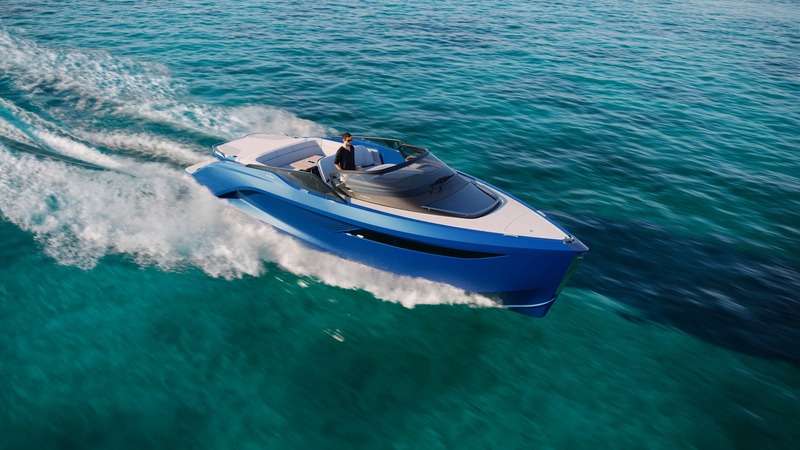 The 500R at Cannes will be hull number one, but Chaser says it can customise any part of the boat for each owner’s tastes. #16 Sanlorenzo SL102 Italian builder Sanlorenzo has made its name with clever designs on stylish-looking yachts. The new SL102 launched in Cannes does not disappoint: instead of having two decks that run on both sides of the interior, the designers decided to use only the starboard deck, which freed up about 10.2 square metres for the interior. That makes a noticeable difference in the yacht’s livability, especially since it made the yacht wider rather than longer. The saloon, which seems more like a waterside villa, also has a fold-down balcony that makes the interior area feel even larger. The SL102 is built on a planing hull, so it’s much faster than the majority of displacement 100-footers on the water. With its twin 2216hp MTU diesels, it reaches a top end of 28 knots. 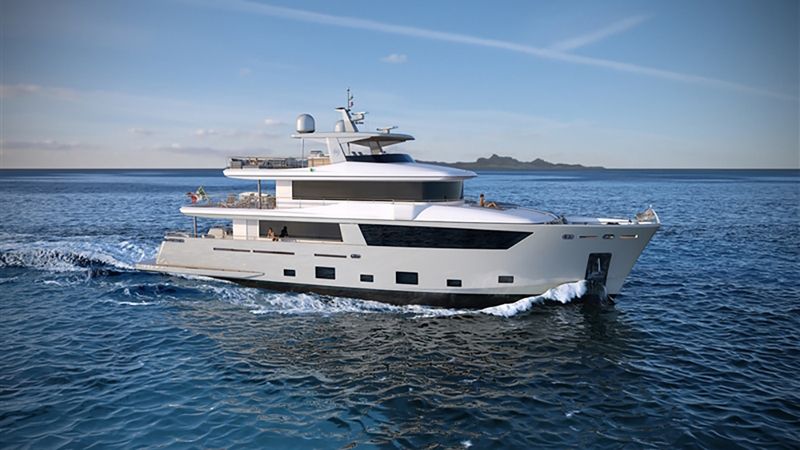 #17 Cantiere delle Marche Nauta Air 110.19 Known for its strong, but lightweight hulls, the 110-foot Nauta Air 110.19 from Cantiere delle Marche was among the line-up in Cannes. Featuring naval and interior architecture by CdM and Nauta Design, the Nauta Air line of yachts is designed to keep an equilibrium between indoor and outdoor spaces, accomplished in part by large windows. The 110.19 houses 12 guests in five staterooms — with the help of two pullman beds — as well as seven crewmembers in four cabins. The yacht’s two Caterpillar C18 engines propel the Nauta Air to a maximum speed of 13 knots with a range of 5000 nm if cruising at 10. Zero Speed stabilizers keep the ride a smooth one. 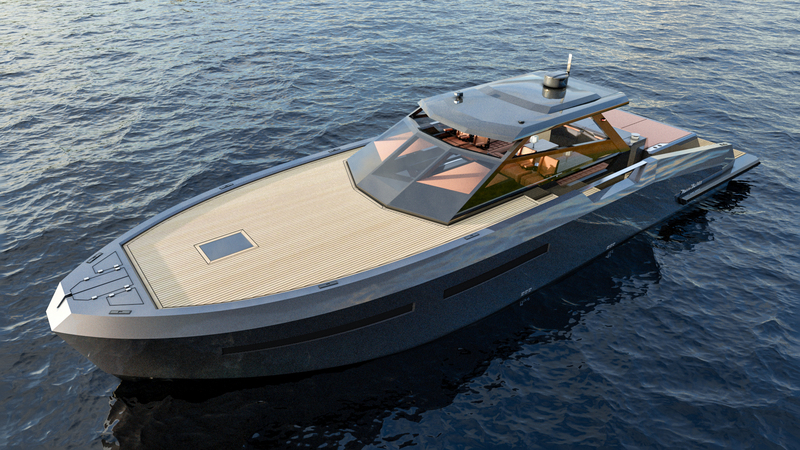 #18 Custom Line 120 Making its world debut at this year’s Cannes Yachting Festival, the Custom Line 120 takes aspects of automotive, aeronautical, and residential design, as well as that of racing power yachts, to create a sporty planing superyacht, the first penned by Francesco Paszkowski Design. A highlight of the Custom Line 120 is the glass door between the aft cockpit and the main saloon. It rests at a 45-degree angle and, to open, it tilts up into the ceiling, as well as opening horizontally. This makes for a true indoor/outdoor living space. Francesco Paszkowski and the Ferretti Group designers created the interior decor. Besides the main-deck master suite, four en-suite staterooms reside belowdecks: two VIPs and two singles. Crew quarters are forward and include four cabins. The flybridge offers up a hot tub and lounging space as well as stairs that lead to the forepeak dining and lounging area. Two garages are located at water level — one at the stern and one forward. All told, the 120 can carry two tenders and a three-person jet ski. The new hull design reduces resistance and, with its pair of MTU 16V 2000 M96L engines, hits a top speed of 25 knots. Its cruise speed is 21, but in the 120’s “economical cruising speed” of 11 knots, the yacht has a range up to 1100 nm.